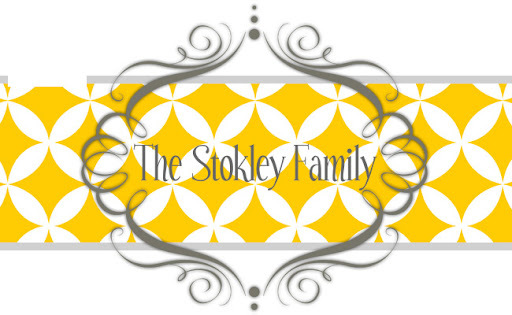 The Stokley Family: Christmas Morning! Christmas morning we got up around 4:45. Tanner came in our room but he wasn't coming in to get up he didn't even realize it was Christmas morning. He was coming in to go back to bed. Ryan was to excited to go back to bed. Here are pictures that I took of their stuff after they went to bed. Tanner waking Ryleigh up. At first she didn't want to get up but once she realized it was Christmas she shot out of bed! Tanner playing his drums. He actually didn't really like them but I think they are growing on him. The one thing she asked for over and over again...a baby high chair! This is her face when she saw the baby high chair...that was the best $10 I've ever spent! I think this is actually kinda scary! I'm sure this will become his Halloween costume! Ry and Tan opening Gi Gi's presents for her. They couldn't stop, everything they saw they wanted to unwrap! After Christmas morning at out house we walked over to moms. Even though I look awful I like this picture of the 4 of us! Look at this wrapping! Tammy's wrapping is insane! I love it but I'm not that patient to wrap like this. New scooters from Aunt Tammy and Mr. Jimmy. Tammy made this picture for me. I LOVE it!!! She also made this one for mom and Larry. I love how it says The Barnes Homes! Since they live in Wilmer and Irvington! The real reason she did it was because it was off centered and she needed one more letter. We had decided to not do present between me, mom, Larry, Ryan and Tammy either. (Mom was secretly heart broken) but we all ended up getting each other things anyway. You all will be happy to know that mom and Larry got me a new CAMERA!!! I was so excited. It's a small one that fits in my purse/pocket! The picture above is of what Tammy and I got mom. We did a whole wall in black frames. It took forever to do but I think it turned out great! I love it and I think she did to. She was so surprised! After we got done opening presents Nana, Paw Paw, Velvet and the boys all came over for breakfast. It was the best Christmas morning! That afternoon Amy, Dale, Dawn and the boys came over but I'll do a separate post for that!